Lace up your walking boots for the Pilgrims Way Challenge on Saturday 22 June 2019. Enjoy the rural beauty of one of England’s oldest and least-trodden national trails. Starting from the picturesque village of Wye, nestled in the Kent Downs Area of Outstanding Natural Beauty, follow the Pilgrims Way to the historic cathedral city of Canterbury and onward via the North Downs Way to a coastal finish inside the impressive inner bailey of Dover Castle. Along the way you’ll pass through ancient woodland, rolling fields and charming villages, as well as a few challenging climbs through the undulating geography of the Garden of England. You must be at least 16 years of age to participate in the Pilgrims Way Challenge and walkers under the age of 18 must be accompanied by a participating adult. With three distances to choose from, the Pilgrims Way Challenge is perfect for people of all fitness levels. Stroll through a charming village of oast houses and period cottages, and soak in an immense sky while surrounded by endless green fields. Rolling hillside views, quiet country lanes, historic buildings and ancient woodland all await you. Walking the Pilgrims Way between Wye and Dover really has it all. From the picturesque village of Wye near Ashford, pass through rolling farmland before climbing up onto the Soakham Downs. From here, the next few miles are dominated by King’s Wood, where pilgrims banded together as protection against robbers. Then a long gradual descent takes you past ancient, timber-framed houses into the pretty hilltop village of Chilham. A short climb to the intriguingly named Old Wives Lees is followed by pushing through extensive orchards and a nature reserve before enjoying views of Canterbury’s magnificent Cathedral and reaching the finish line. The route leads through the historic heart of Canterbury and out into vast fields, passing the farming villages of Hode, Patrixbourne and Womenswold, with a view of the magnificent Georgian mansion at Higham Park before a steady ascent towards Shephardswell. Soon after, you pass the grand Waldershare House and its impressive mews before following the path of an old Roman road that ran between Richborough and Dover. Finally, descend towards Dover as you catch your first glimpse of the sea before reaching the finish line inside the impressive inner bailey of Dover Castle. Take on the ultimate test of endurance and enjoy both sections of the Pilgrims Way described above in one day! After leaving Wye village in the morning and experiencing all the natural beauty east Kent has to offer through the day, arriving at Dover Castle, your final destination, will be a welcome sight. 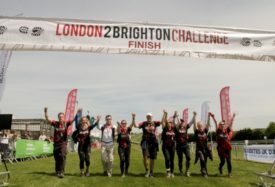 This fully supported event includes regular rest stops with drinks and snacks, a fully signed route, event t-shirt and a hot meal at our Canterbury hospice (the halfway point for 55km hikers) and at the Dover Castle finish. It’s tough but achievable; with some training and determination anyone can conquer the Pilgrims Way Challenge. Take on the hike with family, friends or colleagues, and make more friends along the way! When the welcome sight of the finish line comes into view, you’ll be rewarded with a finisher’s medal and a huge sense of achievement. Dover: Trains run from Dover Priory Station back to Wye (via Ashford) departing every hour; the last train of the night is 23:56. We’re proud to introduce the brand new Pilgrims Hospices Event App, available for iOS and Android devices). It’s free to download from the App Store and Google Play and is the perfect companion to enhance your Pilgrims event experience. Keep your training on track by recording your training activities and liking and commenting on your teammates. 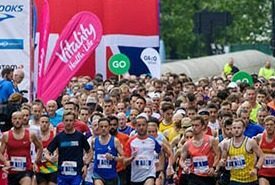 Receive up to date event information, view detailed route maps so you can see if you go off route, and link your JustGiving page to see how your fundraising is going, all in one place. We’ve put together 6/7 week training plans for each challenge distance to help get you hiking fit. The more you prepare yourself ahead of your challenge, the more you’ll enjoy the experience on the big day. Check out the Pilgrims Way Challenge training plans here. As part of the training plans above, we are holding two official training walks designed to help get you walking fit and to build up your confidence with route navigating. Full details of our training walks are available here and on the free Pilgrims Hospices event app (iOS and Android). We cater for all abilities on these walks. We want you to feel good about your walking and have the best possible experience on the day. The walks are free and perfect for those who have already signed up for the Pilgrims Way Challenge and are looking to train, as well as for those wanting to gain some trail walking confidence before registering for the main hike. Guests are welcome to attend the training walks too, although in this instance we do ask that you consider making a donation to Pilgrims Hospices in appreciation for our walk volunteers’ time. 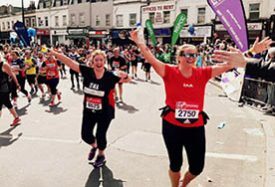 Go the extra mile and walk, jog or run the London 2 Brighton Challenge to push yourself further in support of Pilgrims Hospices. Challenge yourself and experience the amazing atmosphere of one of the most iconic sporting events in the world.